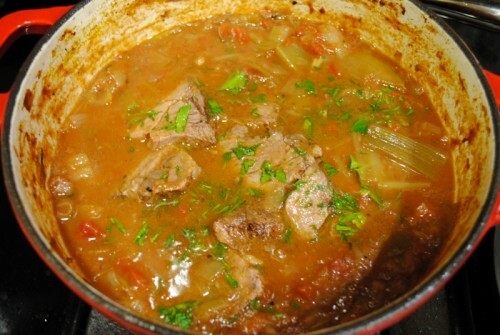 For anyone that is a semi-regular reader, most of my home cooked meals have been braises. 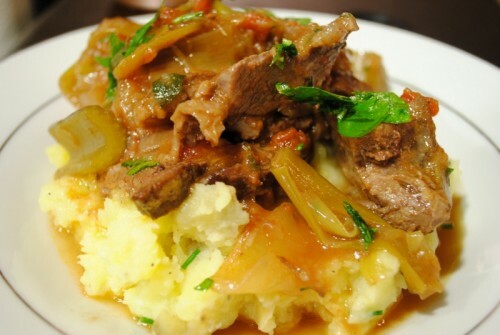 They’re just really satisfying dishes that do take some time, but yield some really delicious, tender meat and creates a good sauce at the same time. 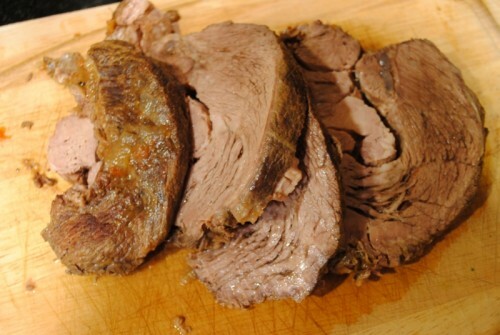 Plus, they’re usually pretty inexpensive to make, as ‘cheap’ cuts are typically the cuts of meat that are braised. My desire to cook a pot roast was somewhat inspired by an episode of Barefoot Contessa that I recently watched – the revelation came to me as I was looking at a stack of leeks in my local Bristol Farms. 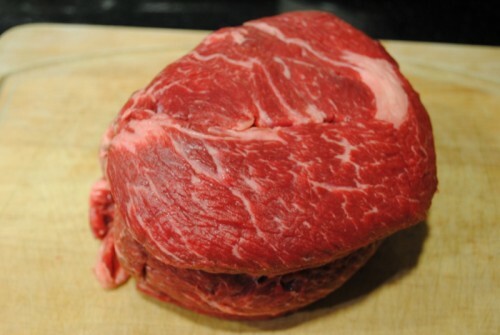 They had a really nice chuck roast in the meat department; thus, my mind was made. I bought a three-pound chuck roast, already tied with butcher twine. With some salt, pepper and flour, I browned this on all sides. 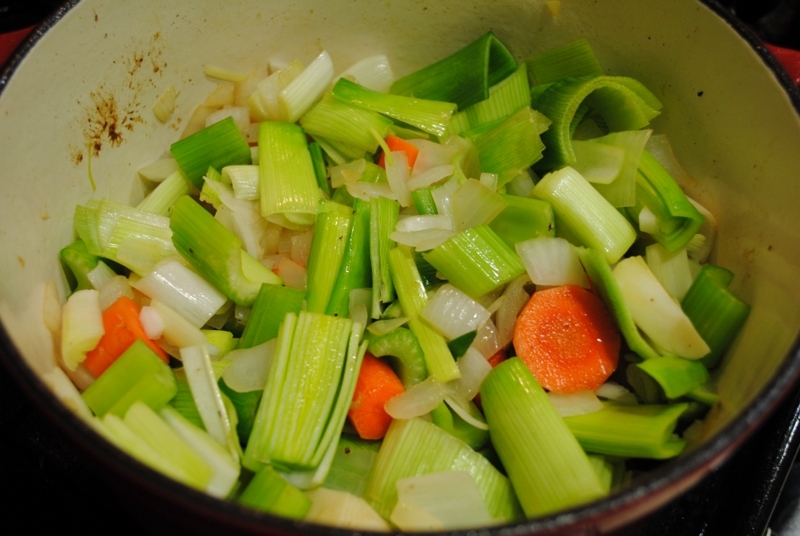 Then I added my aromatics – onions, celery, carrots and leeks. I cooked these down a little bit, then added some red wine, chicken broth and a can of tomatoes. Finally, I put the roast back in for the braise. I put this in the oven for about three hours to let the braise do its work. 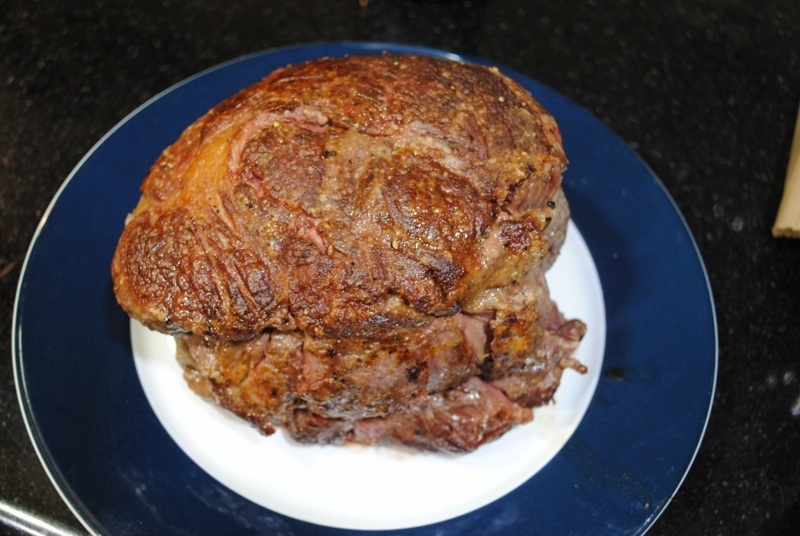 When it came out, I took the meat out to rest, then cut it up into slices. While cutting it up, I could tell it was pretty tender, but not quite “falling apart” tender. 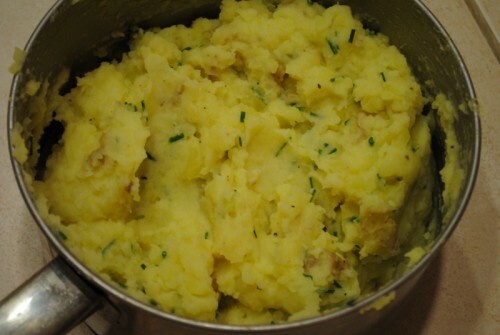 I added these slices back into the sauce to warm, and topped with chopped parsley. I needed something to serve this with, so I whipped up some yukon gold potatoes into a mash, with fresh chives from the garden. I was ready for plating! Overall, my dish was a little bit of a disappointment. My mashed potatoes were slightly lumpy, and not on purpose. Some of the larger potato chunks were a little undercooked, so they left some small chunks. The pot roast itself wasn’t quite as tender as I thought it’d be. It was a little dry too. Hmm. I think I may have cooked it a little too long. In addition, my sauce wasn’t really as thick as I would’ve liked – I should’ve added some flour or corn starch to it at the end…unfortunately, I just totally forgot to do this. Overall it was definitely something I’d eat, but my execution was a little off today. Despite your disappointments, I think it looks and sounds delicious! I just noticed an technical error that I think will greatly improve your braises. A dry braise is usually a product of 3 possible factors. 1. Too high of a temp whilst braising 2. Poorly marbled meat(definitely not your problem. Those are some great cuts your getting) or, what seems most likely the culprit 3. Removing the braised meat from its liquid before it has a sufficient time to cool. If removed too soon, moisture wicks from the meats surface as steam. 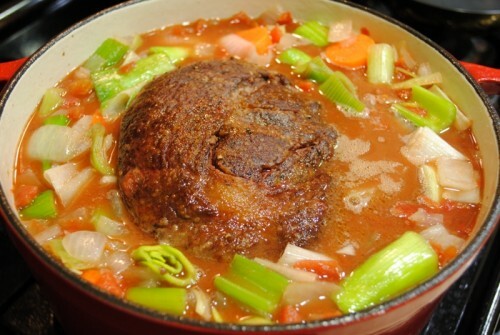 If you allow the protein to fully cool to room temp before taking it out of the braising liquid, then the fibers will fully relax and in most cases the meat will re-absorb some of the surrounding liquid. Also, myosin will fully denature and turn to gelatin and help make your sauce more viscous, at 180-185 degrees internal temp. Hope it helps. Thanks for the tips – I will try leaving my meat in the liquid for a while to let it rest next time!